Sheila Marsh grew up with a love for animals of every size, color, and type. But her favorite was always a horse that she raced with for over 25 years named Bronwen. Her health had recently deteriorated, and doctors began telling family that she didn’t have much time left. So what did the seventy-seven year old grandmother do? She gave them her last wish — to see Bronwen one last time. Sheila’s family and the team at Wigan Royal Infirmary in Lancashire, Britain, went to work to carry out this request. They arranged for Bronwen to visit her in the her hospital bed in the hospital parking lot. The hospital staff then wheeled her outside. BRONWEN SHARING ONE LAST MOMENT WITH HER OWNER AND TEAMMATE, SHEILA. 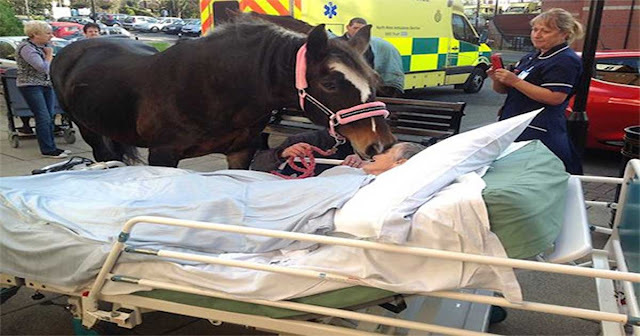 “Sheila gently called to Bronwen and the horse bent down tenderly and kissed her on the cheek as they said their last goodbyes.” A nurse said. A few hours later, Sheila passed away. But she left with a smile on her face after sharing one last precious moment with Bronwen, her beloved horse.